Zynga’s share price plummeted 11.4 percent from $8.09 to $7.19 in the eight minutes after Facebook’s IPO went live, and down 13.3 percent since yesterday. Trading was halted for a number of minutes to stem further losses. Then, the stock came back and started to recover. It’s currently down around 5% overall — and halted again for the time being. 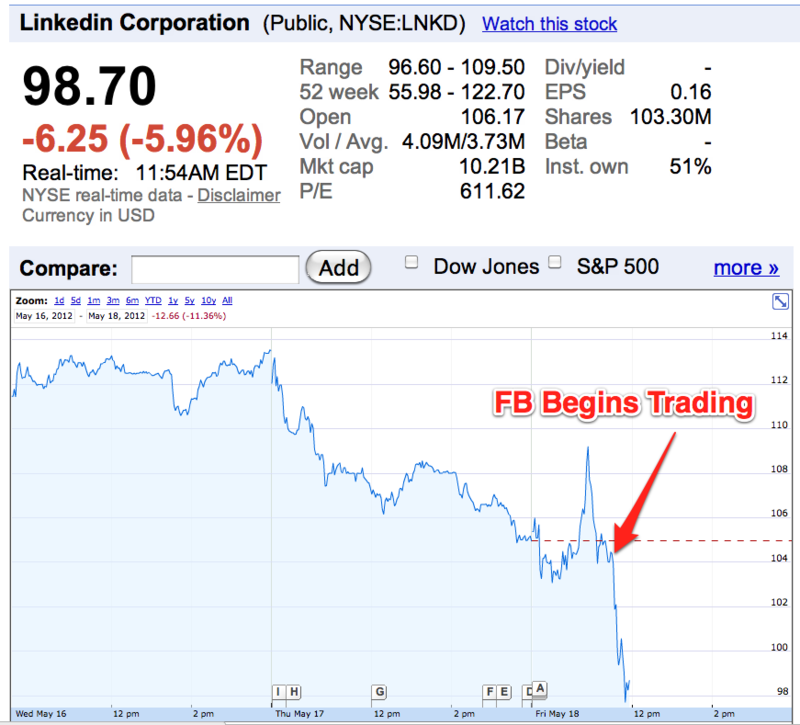 [Update: Public investors spent all day trying to price Facebook, and other stocks have been getting some blowback. 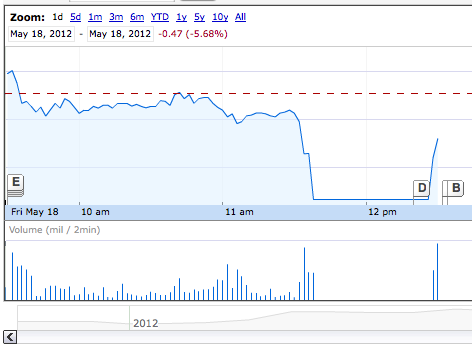 Zynga, the social game developer that makes up around 10% of Facebook’s revenues, was the most directly affected. While Facebook is closing almost exactly on its original price of $38 per share, Zynga closed down 13.4% after some wild fluctuations earlier today. A single large shareholder sold off around 11:17 Eastern time this morning, sending the price to $7.17. That immediately triggered the “circuit breaker” rule that NASDAQ and other stock exchanges have set up — if a single stockholder conducts a sale or purchase that sends a stock’s price up or down by more than 10%, it will place a temporary hold on trading. When Zynga resumed trading around 10 minutes later, it shot up so quickly that the circuit breaker rule triggered again. When it finally resumed trading, the price stabilized downward, ultimately closing at $7.16 (where trading had initially been halted at). What really will matter here is not the market price, of course, but the long-term trends among Zynga and other newly-minted public tech companies. They’re young, with plenty of work left to do in building up their revenue streams. 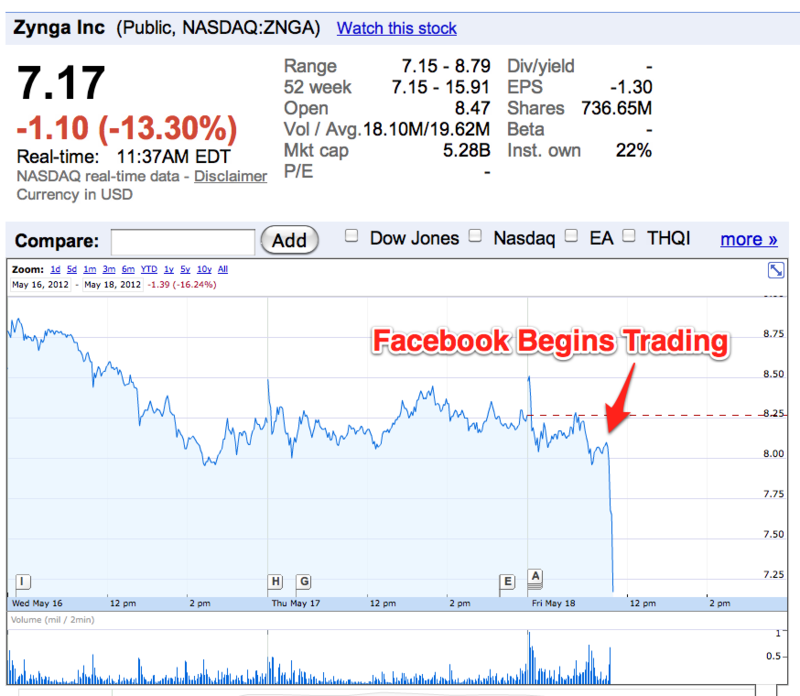 While we can’t know the exact reason why this happened, I’d bet that investors expected Zynga shares to pop alongside Facebook’s during the IPO. But when they didn’t pop at all and instead stayed flat, those short-term investors sold off the social gaming company’s shares. Meanwhile, it seems that other investors had been using Zynga as a proxy for Facebook stock — and now they can move over to buy the real thing. Many other tech stocks have traded downward following Facebook’s open. Chinese social network Renren, professional network LinkedIn, and some other related tech stocks are also down. 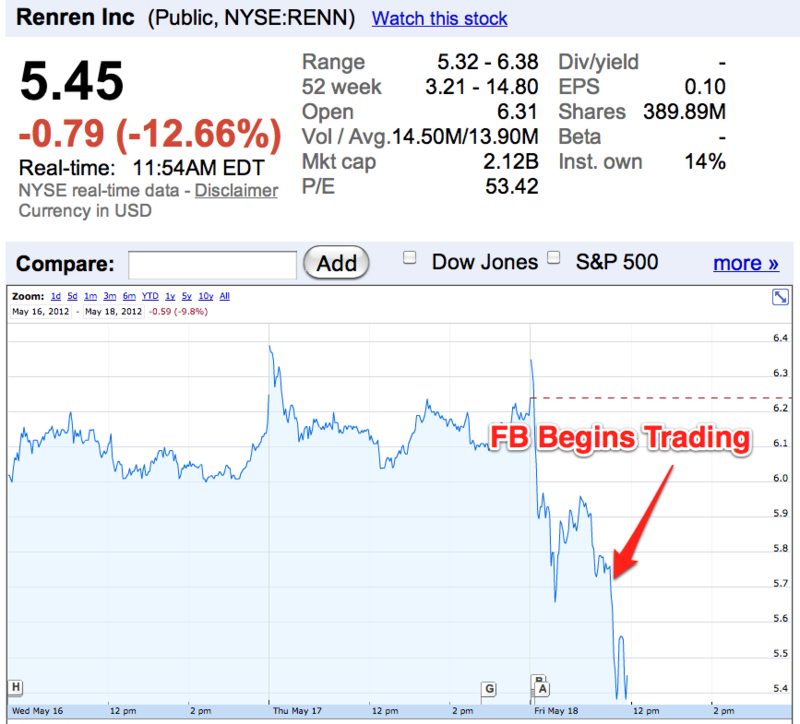 Update: Renren is recovering, It’s now down just 1.16% from yesterday, compared to its place down 12.66% 14 minutes after Facebook began trading.